Cheap technology and access to Resonance FM, the art/noise radio station run by London Musicians Collective, has made sound art less a samizdat activity and more a community-minded experience, practised in solitude but disseminated with ease. This exquisitely packaged release from Vienna’s Nonvisualobjects label, founded in 2005 by Heribert Friedl and Raphael Moser with the aim of focussing on ‘interpretations of minimalism in sound’, is a bumper compendium of hiss and fissures, deep listening rhapsodies and deconstructed noises off. Presented in a numbered edition of 500, its 22 tracks spread across two CDs are an attractive enough proposition. 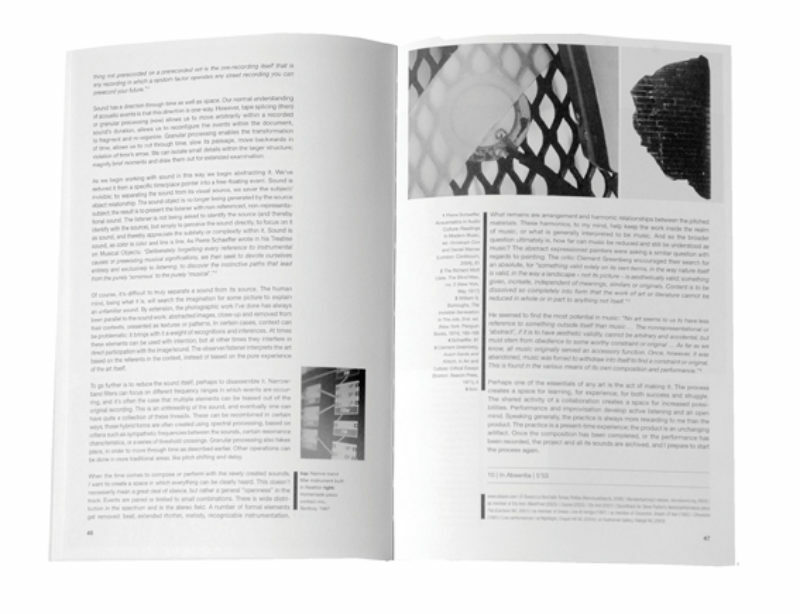 The 96 page hard-backed book which houses them tells the black and white of it even more. By way of a grab-bag of interviews, testimonies, note-book jottings, drawings and photographs, each artist is afforded space to sketch out their practices and working methods as they see fit. So, while some, including Richard Chartier and Friedl himself, submit to generic Q and A, Taylor Deupree offers down-time snapshots of his sojourns in Japan. John Hudak doodles some cartoon figures, while others offload impressionistic autobiography. Keith Berry’s fan-boy relationship with David Lynch by way of his heating system’s monstrous throb is particularly readable. Such contextual detail and immaculate packaging recalls the back-catalogue of Jon Wozencroft’s Touch label, home to Philip Jeck’s sound collages and former Cabaret Voltaire member Chris Watson. Sumptuously styled mail-order quarterly CD of new music, Unknown Public also springs to mind. EXTRACT goes beyond its subjects rattle and hum to more Zen-like applications. As the title implies, many of the barely-there wares don’t come complete, but are tasters of larger works, dropped in without beginning or end. So the chimes of Steve Roden’s ‘air into form/noise into breath’ may be at odds with the hymnal gothic formalism of Ubeboat’s ‘Lux Vivens’, but nothing jars in the leap. Present too is Toshiya Tsunoda, who recently took part in environmental sound installations presented as part of NVA Organisation’s Half Life project in Kilmartin Glen, Scotland. Some pieces, including Tsunoda’s self-explanatory ‘Scenery of vibration/Listening to the reflection of points (@Westspace)’, might be best heard in situ on some increasingly de rigeur sonic walk or other. Most of the time, though, EXTRACT is an enticingly sublime set of pointers to places heard if not always seen.